Closures of smelters by Alcoa, shock Brazil’s aluminium industry, although bauxite and alumina continue to perform strongly, writes Patrick Knight. The news that Alcoa, Brazil’s largest producer of primary aluminium, has closed its 100,000- tonne-a-year-capacity smelter in Minas Gerais state, and slashed production by almost 150,000 tonnes at the 460,000-tonne-capacity Alumar smelter that Alcoa shares with BHP- Billiton in Maranhao state, has shaken Brazil’s aluminium industry to the core. Alcoa has cut its output of primary aluminium worldwide, in an attempt to reduce the massive supply surplus which is keeping aluminium prices to below what it costs to produce at many mills. Because Brazil is now one of the world’s highest-cost producers of primary aluminium, a high proportion of Alcoa’s 21% cuts in its global capacity, have been concentrated there. Even before the latest cuts, Brazil produced almost 20% less aluminium last year than a decade ago, following earlier cuts by Alcoa and two others, Novelis and Votorantim. There is now about 400,000 tonnes of unused smelting capacity around the country. The cuts have come at a time when demand for aluminium in Brazil is growing by more than 5% a year. The amount of primary aluminium consumed there increased from 750,000 tonnes in 2003, to 1.5mt (million tonnes) last year. If demand continues to grow at the present rate, 3mt of primary aluminium will be needed in Brazil by the early 2020s. With only 1.3mt to be produced this year and no new mills planned, even if the mothballed facilities re-open, most of the extra needed in future will have to be imported. Because the industry pays well above the average price for the electricity it uses, no new smelter has been built in Brazil since 1985 and nobody plans to build one for the time being. According to Adjamar Azevedo, a past president of the Association of Brazilian Aluminium Industries, Abal, whether the mothballed smelters are started up again depends on action by the government. It will be a political, not a technical decision, he says. Azevedo says that for the time being, the industry in Brazil is “just trying to survive” and it is “at a cross roads” regarding its future. Another reason so much smelting capacity has been halted in Brazil, is that selling surplus electricity has become more profitable than using it to make aluminium. Months of exceptionally dry weather has cut water levels at many of the lakes which feed the hydroelectric power stations normally responsible for 80% of the electricity generated in Brazil. This has caused the price of free market ‘spot’ for electricity to soar, making it more attractive for the aluminium companies, most of which generate 60–70% of the electricity they use, to sell as much as possible on the spot market. In response to pressure from industry and anxious to attract votes in the forthcoming elections, the government promised to cut the price industry pays for its electricity by 28% last year. But in the end, prices fell by only 6%, as taxes were not reduced. Concerned that changes in Brazil’s Mining Code may mean companies have to pay much more in royalties for the ore they mine from now on, is also making the capital intensive aluminium industry nervous, at a time of a world surplus of several metals. The cuts have come against a background of strong growth in all industries which use aluminium in Brazil. Almost a third of the aluminium made in Brazil or imported is used by the motor industry, which has seen sales of cars and trucks almost double to more than three millions units in the past few years. Packaging is the second-largest market and, with consumption of consumer and other goods growing faster than the economy as a whole, demand for packaging has been growing fast as well. A construction boom has been under way in Brazil for the past few years, spurred by easier access to credit, so houses and commercial properties now take 16% of what is used. Demand by the electricity industry, mainly for long distance transmission cables, has always behaved erratically. But with 50,000km of transmission lines needed to bring the electricity to be produced at a new generation of large power stations being built in the Amazon region to consumers in the south east, demand for cables is expected to take up to 15% of the total used for several years. More aluminium will also be needed by the oil industry, for equipment needed at the fast growing offshore fields and for a new generation of light and fast supply boats needed to service fields up to 300km from the shore. More aluminium will be needed to make new alloys used on platforms and underwater equipment on the sea bed and in wells. Even before the latest round of cuts, Brazil had slipped from being the world’s sixth largest producer of primary aluminium to being the eighth. If prospects are gloomy for the production of primary aluminium, they continue to be bright for both bauxite and alumina. 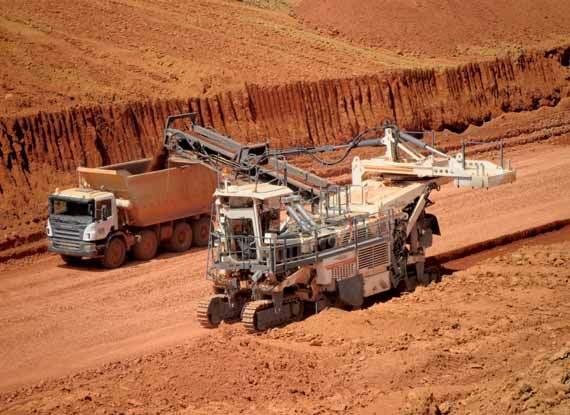 Brazil has reserves of an estimated 7.5 billion tonnes of bauxite, the world’s second largest. About 35mt of bauxite is now mined each year, with about 7mt of that exported, most from ports adjacent to mines near large rivers in the Amazon region. If Alcoa has cut its production of aluminium, it continues to expand its new mine located at Juruti on the main Amazon river, where 4.45mt is now produced a year. Some is destined for Alcoa’s own alumina plants, which now make 2.1mt a year, the rest is exported directly from a port at the new mine. Norsk Hydro has now assumed almost total control of the Barcarena alumina mill it bought from Vale a few years ago, after that company decided to exit the aluminium industry and concentrate on its iron ore assets. Norsk Hydro is also increasing production of bauxite at its Paragominas mines, the bauxite taken to Norsk’s alumina mills or for export along slurry pipelines. As well as being the world’s number two in bauxite, Brazil is also the world’s third-largest producer of alumina, of which about 13mt is now made. Close to 10mt of alumina is now exported each year, again most leaves from ports in the Amazon region. Even if Brazil continues to slip down the list of aluminium manufacturers, its importance to the industry as a leading source of both bauxite and alumina continues to be guaranteed. Despite fast growth in demand in all sectors, each Brazilian now consumes an average of only 7.5kg of aluminium each year. Although this is twice the amount consumed per capita a decade ago, it is still only a third of what the average consumer in developed countries uses. The average car made in Brazil now contains only 50kg of aluminium, a third of the amount used in vehicles made in the United States and Europe. With pressure growing to make cars more fuel efficient, much more aluminium will be needed by this industry from now on. Some of the companies now building new factories in Brazil, such as Land Rover and Jaguar, use aluminium for bodywork, as does Mercedes for some models. Brazil is a world leader in the amount of aluminium recovered and re-used by the can industry, and 98% of the 270,000 tonnes of thin sheet used each year for this purpose is recovered. Used cans are re-cycled and on sale again just a few weeks after old cans have been collected by an army of collectors, a process which saves an enormous amount of energy. About half a million tonnes of aluminium of all types is recycled in Brazil, 35% of the total used each year. Despite the current difficulties aluminium smelters are facing in Brazil at the moment, they are unlikely to give up on the country, as much of the aluminium smelted around the world is produced in countries whose stability is not guaranteed.